The wind blows cold and the letter box on the front door flaps back and forth sending an icy blast through the house. In many places people have a letterbox fitted into the front door, rather than a remote post box. It is convenient as the bills get delivered straight to your doormat! The problem is you have a hole in your main front door - not energy efficient. You need to keep the warmth in and the cold out. Obviously no one leaves just a hole in the door, well most don’t, a letter box flap covers the hole but they tend to leak, reducing the effects of having a hole in the door but only by a little. 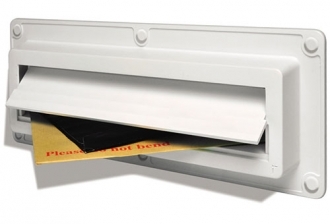 When a large packet is forced into the letterbox it is often left forced open, delivering the outside temperature into your house. Hence it is good news that Ecoflap, a company that produce solutions to the problem, have a new letter-flap that covers the hole but also allows delivery of sizable letters and packages and is claimed to be secure in winds up to 100 mph! The Ecoflap Twin is an entire unit, with two flaps, one outside and one inside. The Ecoflap Twin is equipped without brushes or springs, making it far easier to post packages all the way through, preventing items being wedged part-way through and left open to the elements. Endorsed by the UK’s Energy Saving Trust, Ecoflap has also proved to be highly effective as part of the solution for zero carbon houses. So stop flapping around and fit an Ecoflap to your door, you will still get the bills but at least the utility bill will be smaller. Here is video demonstrating the Ecoflap.